Safety Platforms are delighted to launch their new “Easy-Load” bracket which removes the need for carrying heavy plasterboard sheets up stairwells by allowing sheets to be passed up through a hole in the floor. Up to five 33kg sheets can be loaded onto the bracket, the operatives then walk to the upper floor, remove the sheets and stack them ready for use. Easy-Load makes loading out SAFER, FASTER, EASIER and SAVES MONEY! Easy Load bracket simply hooks onto any ladder or a Stairsafe frame (not included within price). Many professionals within the industry including The Health & Safety Executive are very concerned about the risks of musculoskeletal injury when carrying sheets of plasterboard up stairwells. A risk of falls from height is also created when removing stairwell edge protection to allow large sheets to pass to the upper floor. Easy-Load substantially removes both of these risks. Easy-Load allows just two operatives to lift the heavy sheets, without the bracket and considering manual handling regulations a further two operatives would be required to receive the boards on the upper floor. Even with lighter standard sheets considerable labour savings can be achieved. Operative feedbacks from site trials has stated that in the region of half a day can be saved when loading out a typical house first floor with in excess of 200 boards. Operatives who are using Easy-Load on a regular basis say it is far easier and less physically demanding than walking up and down stairs over 200 times whilst carrying heavy sheets! The substantial labour savings achieved will quickly repay the small outlay and will save time and money on every job thereafter. 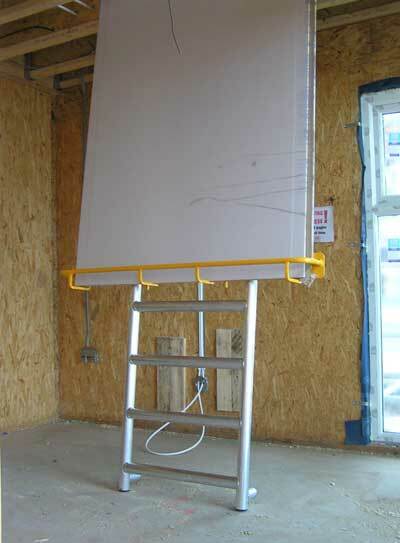 Easy-Load can be hooked on to any standard ladder or the ladder frame from the Safety Platforms Stairsafe system. Easy-Load has a safe working load of 150kg, care should however be taken to ensure the ladder it is used with has a suitable load capacity for the loads being placed in the bracket. The Health & Safety Executive have looked at the handling of plasterboard in great detail and prepared a very interesting and informative report which looks at the issues and possible solutions.